... no, no, not that George! 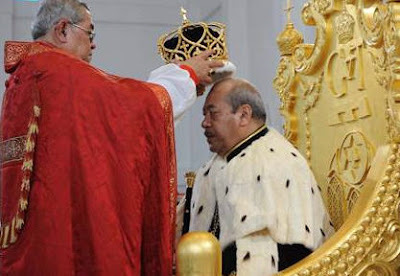 King George Tupou V (Tongan full name: Siaosi Tāufa'āhau Manumataongo Tuku'aho Tupou V) was crowned August 1st, having actually succeeded his father September 11th, 2006. The Archbishop of Polynesia Jabez Bryce led the ceremony at the Free Wesleyan Church of Tonga. "With thy head anointed with holy oil as kings, priests and prophets were anointed. As Solomon was anointed king and Nathan the prophet were anointed, so be anointed, blessed and consecrated king over the people who the Lord thy God has given thee to rule and govern. By this anointing pour down upon his head and heart, the blessing of the Holy Spirit and prosper the work of his hands. With the assistance of his heavenly grace, may he govern and preserve the people permitted to his charge, in wealth, peace and godliness and after a long and glorious course of ruling a central kingdom, wisely, justly and religiously you may last be made partaker of the eternal kingdom through the same Jesus Christ our lord. Receive the ring of kingly dignity as you are this day consecrated to be our head and prince so may you continue. Be rich in faith and be blessed with good works and may you reign with him, who is the king of kings to whom be glory forever and ever. Receive the royal scepter, the enzyme for kingly power and justice. Sanctify your servant George Tupou on his head this day as a sign of majesty..."